The River Ice Photo Blog | Photos featuring the weird and wonderful world of river ice. Welcome back to the River Ice Photo Blog! It’s been a while since my last post – in between I retired and became a Professor Emeritus and moved 5000 km (~3000 miles) to the east coast of Canada. It’s been a mild winter here – up until now at least – and so I’ve not done much river ice hunting. However, for the first post of 2015 we have some great photos by David M. Brenner – a river ice enthusiast in Ames, Iowa. David calls these “ice teeth”. Here’s another picture that David describes as the U-shaped terminus of a lead. I’ve not seen these before, so if any of you river ice experts out there have an explanation of what might be happening here – please comment below. Thanks David for sharing your photos! Anchor ice occurs frequently on the Kananaskis River – it forms when suspended frazil ice adheres to the stream bed. Because the river is regulated for hydro-power production, water levels vary substantially over the day, each day. This leaves anchor ice exposed at low flow. The second is a photo taken that was taken by Vesa Kaloinen at Lake Suolijärvi in Tuulos, Finland. 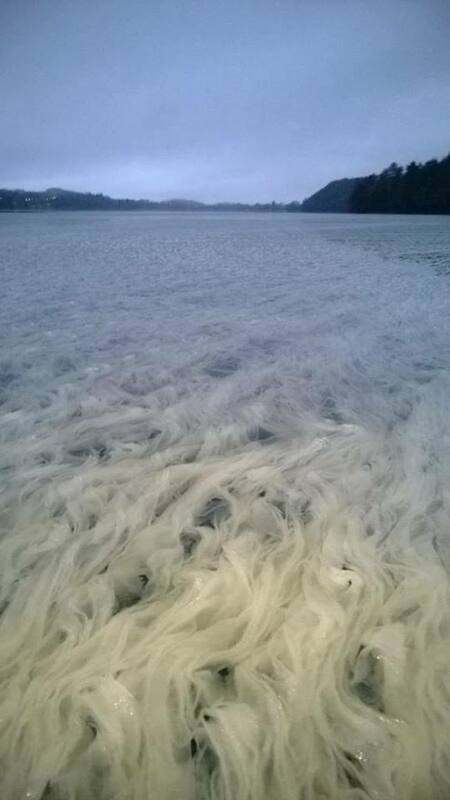 Snow falling on the lake created some weird submerged ice (snow?) that looked like huge strands of noodles. Thanks to my river ice friends who shared these with me. Hope you enjoy these! Have a great week!